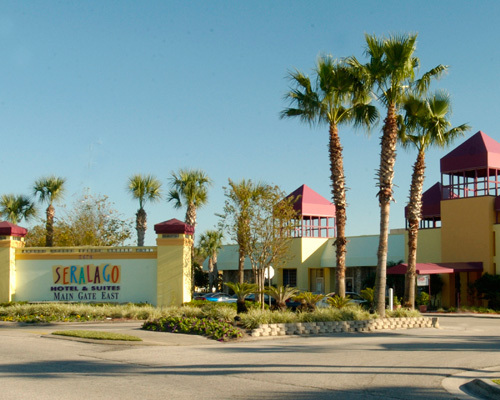 An affordable, family-friendly hotel in the heart of Kissimmee, Seralago Hotel & Suites offers 614 comfortable accommodations just minutes from Walt Disney World® Resort, ­Universal Orlando® Resort, Old Town Kissimmee and more. Guests can enjoy scheduled shuttle services, two Olympic-sized pools and a kiddie pool, a full-service restaurant, a fitness center, a sundries store, and more. 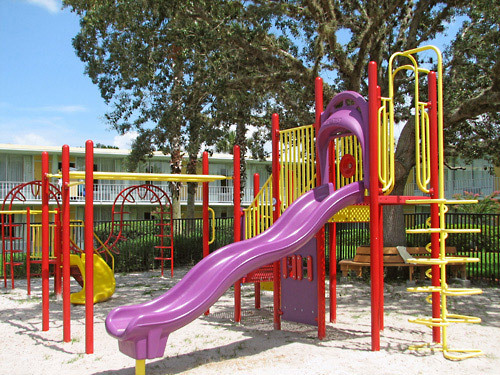 Located 5.3 miles from Walt Disney World and 13 miles from Universal Orlando. Schedule shuttle service to nearby area theme parks is available. Guests can request pet-friendly rooms. Amenities include free Wi-Fi, 2 heated outdoor pools, and a microwave and mini-fridge in-room. Food court, cafe, and bar on-site. Conveniently located in the Kissimmee area, the Seralago Hotel & Suites offers one of the best values near the Walt Disney World® Resort. Relax in one of our 614 rooms and suites, swim in our 2 Olympic-style heated swimming pools, or let the kids splash in our children’s pool. Guests can choose from reasonably priced rooms and suites, complete with a range of amenities that includes mini-refrigerators, microwave ovens, and iron/ironing boards. Travelers will enjoy our notable facilities, which range from a full-service family restaurant to tennis courts and a fitness room. Our meeting rooms can accommodate functions such as small corporate meetings, wedding receptions, and birthday parties. Seralago Hotel & Suites implements a $9.00 per room, per night Resort Service Fee plus 13.5% tax. How many rooms are available at the Seralago Hotel? There are 614 rooms in total. Does the Seralago Hotel & Suites have cribs or rollaway beds available? Yes. Cribs are available free of charge. For an additional charge of $10, rollaway beds are available. Are guests allowed to check-in early at the Seralago Hotel & Suites? If the room is available, guests are allowed to check-in early. However, check-in is not guaranteed until 4:00 pm. Does the Seralago Hotel & Suites offer a shuttle to the theme parks? 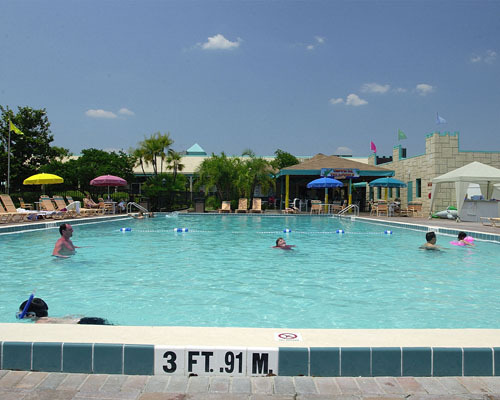 Seralago Hotel does offer a complimentary shuttle to the Walt Disney World Theme Parks. It is a free scheduled service that provides transportation to all four theme parks. Shuttle to other theme parks, including Universal Orlando Resort & SeaWorld, are available for a nominal fee. Does the Seralago Hotel & Suites have a restaurant on-site? There are four dining options available at the Seralago Hotel. The Vineyard Café offers full-service family-style dining. There are open daily from 7am-11am. 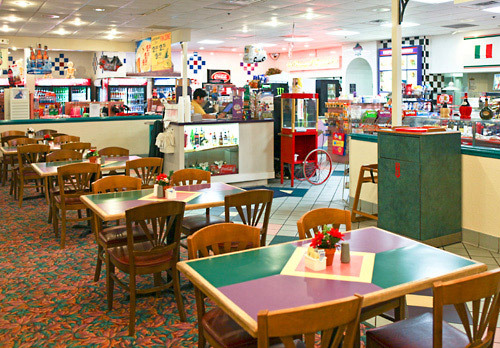 The People’s Choice Food Court & General Store offers on-the-go fast food items. 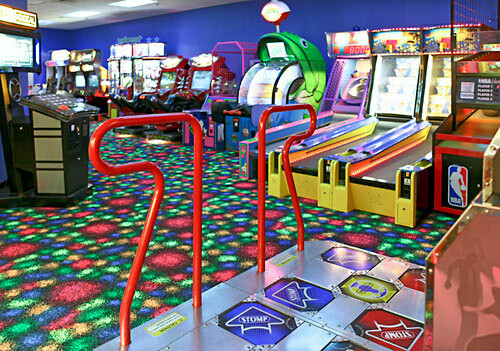 It is open Sunday -Thursday from 6:30 am - 2:00 pm & 5:00 pm - 10:00 pm. It is open Friday & Saturday 6:30 am - 11:00 pm. 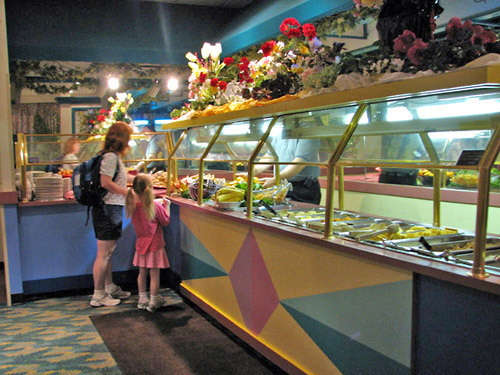 The Tropical Pool Bar offers drinks and snacks and is open seasonally. The Court Street Bar is open from 5pm-Midnight, Thursday thru Sunday. Is the hotel pet-friendly? If so, what are the pet fees? Yes, Seralago is a pet-friendly property. They do charge a one time fee of $40, which would be paid at check in. They have a 50-pound weight limit and require your pet to be crated when you are not in the room. Note: you do need to request a pet-friendly unit at the time of reservation.